A recent survey from a sales and marketing research firm revealed that “how to master the telephone” was the single most challenging activity for direct sales and marketing professionals. For some, fear of the phone and telephone prospecting techniques are on par with public speaking. They try and avoid it at all cost. Sales and marketing boils down to effective communication skills and the ability to connect with a prospect. And unlike e-mail and direct mail, to borrow one of AT&T’s old slogans, the telephone allows you to reach out and touch someone. Other than a face to face meeting or using a service like Skype, no other prospecting tool can convey what I refer to as “Connection Emotions,” e.g., confidence, conviction, belief, passion, compassion, sincerity, empathy, enthusiasm, and genuine warmth like the telephone can. That means having your head and your heart in the game prior to ever picking up the phone. If need be, play some mood music and take some quiet time to gather your thoughts and visualize your intended outcome. Telephone prospecting should be looked at as an imperative skill that’s every bit as important to develop as any other skill. That means no TV glaring in the background, no barking dogs, no crying babies, no music playing, or anything else a prospect can hear on the other end. Even if you’re a home-based business entrepreneur, that’s no reason not to be as professional as you would in a traditional workplace environment. Am I merely going to qualify my prospect? Build rapport? Establish trust? How do I want this call to end? Send them to my website? Send a package in the mail and schedule a follow up call? Look for my e-mail? Schedule a luncheon appointment? Know your next action step prior to even picking up the phone. 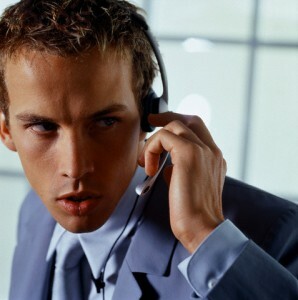 The key to effective telephone prospecting is to imagine your prospect was literally standing right in front of you. How would you come across in person? Your tonality? Your voice inflection? Your facial expressions? Your body language? That’s exactly how you want to come across on the telephone. Wearing a headset and standing on your feet allow you to do just that. Hand gestures and body language are a natural form of expression. Your posture, your tonality, and your voice inflection are impeded when you’re sitting down at a desk and holding a receiver. You want your thoughts and your feelings to flow freely and be expressed in unencumbered ways. Only by recording them can you spot your weaknesses and know which aspects of your prospecting calls need to be improved upon. It’s akin to NFL teams studying film of their last game and seeing first hand what they need to improve. Remember that you’re in business, so take it seriously and look for every opportunity to improve your performance. Remember that facts tell but stories sell. Personal stories are the bonding agent between you and your prospect. People don’t want to be sold; they want to be informed. Demonstrate the problem solving ability of your product or service by sharing a personal story that your prospect can relate to on an emotional level. Dialing for dollars and getting rejected time and time again can wear on your nerves, much less your confidence and conviction. One way to deal with that is to know exactly what every phone call you make is worth regardless of the outcome. For example, if 25% of your work day is spent prospecting on the phone and your average monthly income is $5,000, than $1250.00 or 25% of that income can be attributed to your telephone prospecting time. Assuming a ratio of 24 dials an hour for 2.5 hours (25% of a 10 hour work day), that’s 60 dials a day. If you work 20 days a month, that’s 1200 calls. $1250/1200= $1.04 per call. When you know you’re making a $1.04 every time you dial the phone regardless of the outcome, it makes it a lot easier to endure the rejection. Prospecting is pure and simply a numbers game. The fact is, more prospects are going to say “no” than say “yes.” Don’t take it personally. Rejection is nothing more than delayed reward. Know the numbers, stay the course, and keep dialing for dollars! The name of the game is efficiency. Get your prospect on the phone, achieve your objective, and hang up. Other than for the purpose of establishing rapport, building trust, and qualifying your prospect, save the small talk and chit chat for another time. Like anything else, practice makes perfect. Repetition is the key to becoming a master telephone prospector. The more calls you make, and the more you analyze them, and the more you improve on your performance, the more you close the gap between prospect and customer. With so many things that need to be done in the course of a business day, it’s no wonder why sales professionals (whether network marketers or not) get caught up in the daily grind, lose their focus, lose sales and deliver sub-par results.The truly successful know that every day is an opportunity to improve their business, increase their skills and to earn more quality clients. This “Top 10″ list is the perfect blueprint on how to efficiently qualify your leads in no time flat and be more personable in this technology driven world.Thanks for the brevity and simple step by step checklist. Excellent points that cut to the chase. Easy to implement professional and common sense tactics that I’m certain are overlooked in our overly casual business atmosphere on a daily basis. Master these techniques and forget about the so called robo-calls, you’ll stand out from the crowd.